This is a very unusual Keith Murray for Mappin & Webb item, firstly because it is a cake stand and secondly because each of the "plates" has a hand beaten centre. 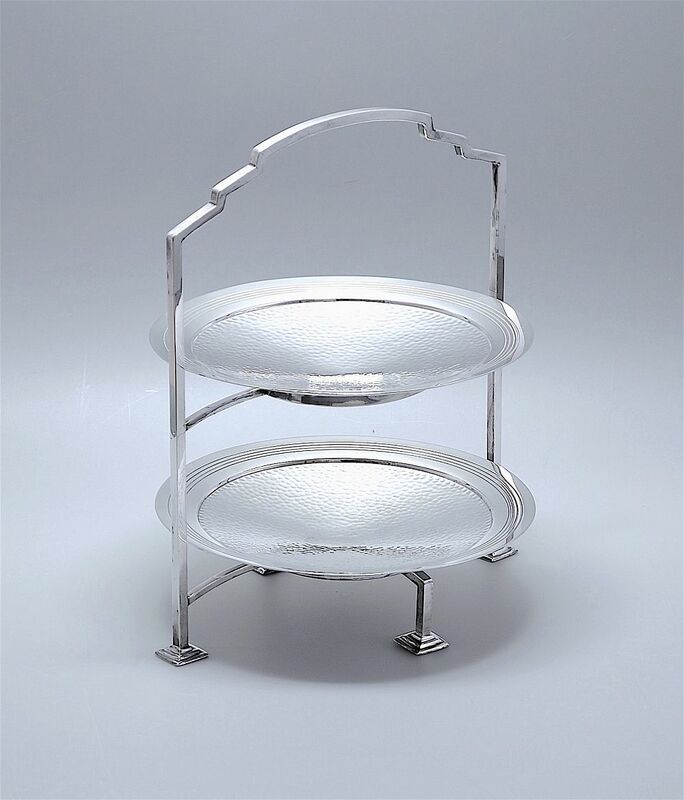 The silver plated frame has 4 square tiered feet and a domed shouldered top. The 2 "plates" or shallow tazzas each sit in a round silver plated holder that is suspended within the frame by two silver plated bars. Each tazza has a wide outer ring with the 4 incised rings typical of Keith Murray/Mappin & Webb designs. The slightly concave centres and the undersides of those centres are hand beaten. The undersides of both tazzas are stamped "Triple Deposit Mappin & Webb Prince's Plate London & Sheffield" with a stylised teskilion mark and a shield shaped cartouche stamped with an"l" in lower case with "W28408" stamped below that and "M421" below that.